Hey hey! How’s it going? I have to ask you a question. Do those little Girl Guides (similar group to Girl Scouts in the US) get you every.single.time? I swear, I think they are little masterminds. So, I have, like, 3 boxes of cookies in my pantry now. Three! I never have 3 boxes of cookies at one time in my pantry. Those little buggers are sneaky. A little girl came to the house the other day selling them. Hubby answered the door and there she stood, only a little peck of a thing all dressed up in her little suit, proudly holding up a box of cookies and asked if he wanted to buy. How could you possibly say no?! Then, I came home the other day and there’s another box on the counter. ‘Where did these come from?’ I ask hubby. Yeap, they got him again. Then, I was at the grocery store and as I was leaving there was about a dozen (no lie) of these little girls on the way out totally laser eyeing me. I couldn’t just walk past them like a cold hearted person, could I? Nope. ‘What flavours do you have’ I ask. Got me again. These Girl Guides are starting to become a problem to my waist line. I’m thinking in the future, I’ll just hand them over my money and tell ’em to keep the dang cookies, lol. But, Girl Guides, I’m onto you. Anyway, on top of cookies, why not make donuts? Sounds like a sensible thing to do, right? Yeah, no. But, in for a penny, in for a pound, as they say. Plus, I totally promised you guys that another baked donut recipe was on its way. It truly amazes me how I lived all my life without a donut pan. For reals. I can’t believe how easy it is to whip up a fresh batch of donuts. Like, under a half hour you’ll have these prepped, baked, rested, glazed and in your belly…and then debating if you should make more, like, right then and there. Plus, you know every single ingredient in there. Want more lemon zest? Go for it. Want less? You can have that too. There’s no turning back for me now and you’re going to love these as much as I do. There’s no surprise that I’m using lemon and coconut in my baking again. I can’t get enough of that stuff as indicated by here, here, here, and here…..oh and here. I may have a little obsession with lemon and coconut and, I swear, it has nothing to do with the giant bag of lemons I typically pick up at my local Costco. I always have lemons in my fridge. Along with mushrooms. Garlic and onions are always in my pantry as well as dried and canned beans and tomatoes. What are some staples that you have got to have at all times? 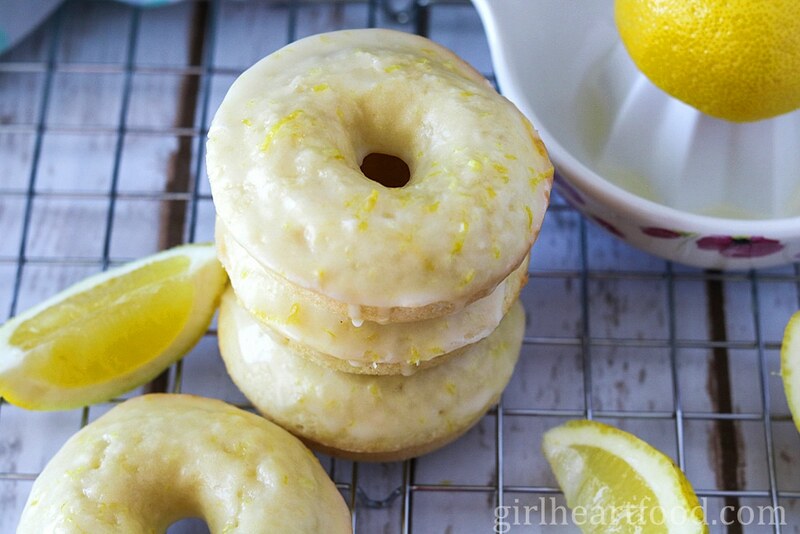 These donuts are packed with coconut and lemon in both the cake base and the glaze. And while these are resting after they are baked, your glaze takes seconds to make. Just combine all the ingredients, stir until smooth and done! Dunk those babies into the glaze and try not to devour every single one. And if you did, no shame. That are, after all, baked. Do you tell yourself little things like that to feel better? I’ll assume you said yes like me. I know you wouldn’t leave a girl hangin’. So next time you have a hankering for something sweet, whip these babies up. Your belly will thank you. These Baked Coconut and Lemon Donuts are packed to the max with coconut and zesty lemon! There's three forms of coconut in these bad boys - coconut oil, shredded coconut and coconut extract. Plus, there's lots of fresh lemon zest and juice. Who needs the coffee shop when you can have these? Preheat oven to 400F. In a bowl combine flour, sugar, baking powder, salt, lemon zest and shredded coconut. Stir to combine. Lay to one side. In another bowl (or using stand mixer), add coconut oil, coconut milk and stir to combine. Add egg and mix until just combined. Add vanilla extract and mix to combine. Add flour mixture and mix until just combined. Spray 6 unit donut pan with Pam and distribute batter evenly. Bake for 8-9 minutes. Let cool in pan about 10 minutes before removing and glazing. In a small bowl, combine all ingredients and stir until combined and smooth. Invert each donut in there to get glaze on top. Best enjoyed immediately! I’ve used the ‘baked’ excuse too many times to count, and I never feel bad about it 😉 These look delicious! Hehehe 😀 Glad to hear I’m not the only one 😉 Thanks Lauren! I totally need to get a donut pan myself especially if I can create deliciousness like this. This coconut and lemon combination is dreamy!